"Imagine stepping through a portal into a twilight realm, filled with trees as far as they eye can see. Breathtaking vistas and amazing discoveries await you around every corner. But beware! Not all denizens of the forest respond to your intrusion lightly." Diverse boss battles with actual mechanics. Items and loot with unique traits and functionality. Ongoing development, we never stop! Street cred; OG 2011 modding represent! 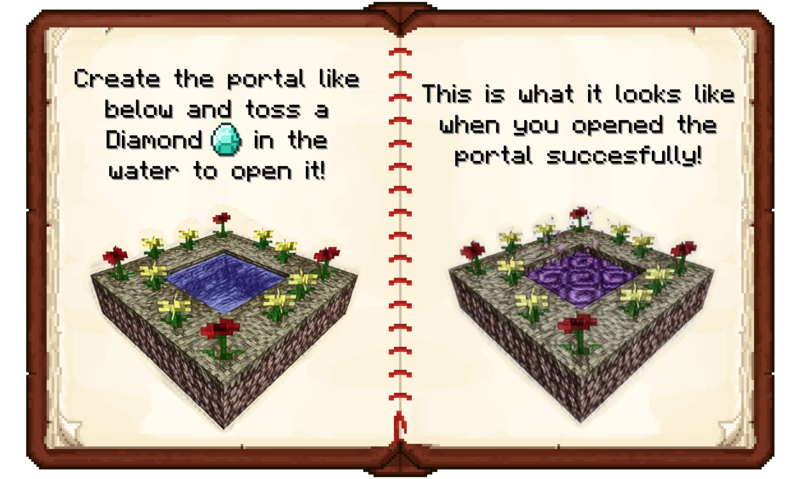 To get started in the mod, you first need to create a portal to access the Twilight Forest, after doing so you're ready to explore! The frame is made out of Grass, Dirt, Podzol, Mycelium, etc. On top of the grass are flowers, mushrooms, leaves, plants, etc. The frame must be completely filled with water. We as TeamTwilight will continue to work on Twilight Forest and provide content updates at our own pace. This means that even after we finish something like the Final Castle we will continue to put out content, there is a vast amount of ideas and features in our design documents still! These are mods we add content for if they are used alongside Twilight Forest and are optional, do however always get ConnectedTexturesMod for the best experience and awesome textures. ConnectedTexturesMod Is the most important one to get, as it is used to help us have the awesome looking and fancy textureworks we create. Tinkers' Construct We now natively have added support for our materials to have tools made out of them, no longer requiring low effort third party mods. Each of our materials also adds unique & one of a kind traits to your tools, try them out! Thaumcraft Just like many years ago in previous versions we added Thaumcraft aspects to each and every one of our items for all your thaumaturgical needs. Chisel Do you like blocks with pretty textures? Use our Chisel integration to easily and on the fly swap between one variant of Nagastone to another, this works for all sorts of other blocks too. Immersive Engineering If you want to represent Twilight Forest with fancy shaders on your Drill, Chemthrower, etc. from IE you now can, most of them have unique and fancy effects on them too! You can join our Discord server to talk to us, learn about new & upcoming content, and more! Stay a while, stay forever! We also have our own official Twilight Forest server you can join! Report bugs and crashes to our Issue Tracker. I want to make it so that the player spawns in the forest but NOT have an exit portal be next to you. Is this possible? Can this be used in a modpack? this was updated on my birthday! my favorite minecraft mod was updated on my birthday! OMG, I am literally crying ATM. I thought Twilight Forest was gone! I'm so happy to see it back. Best Minecraft mod ever!!!!!! I lost my old world due to intervening updates, but I can't wait to get started with a new one and discover the forest all over again. Please, please, please, keep this mod alive. I gave up playing Minecraft for over a year when I lost it. So excited!!!!! could you put in the change log that it needs the 2680 forge? I cant believe you made a Monty Python reference with the Twilight Litch's death achievement. lol, someone understands me. But also, I'm really happy that you brought back this mod. I'm my opinion, this is the best dimension mod in Minecraft history. great modpack. 1 suggestion. add a burn time to your saplings? awesome mod pack. have one major issue with it though. when i go between worlds it takes parts of the previous world with me and glitches the new world until i quit out and go back into the game. Is there going to be an update to the 1.7.10 version?